If the answer to this questions is YES, then why not apply to the BlueBRIDGE Competitive Call – Data management services for SMEs. The call gives you free access to BlueBRIDGE’s data management services, computing resources and datasets. BlueBRIDGE services can help improve the services that you provide to your clients and save you both time and resources. The main objective of this call is to support 5 European SMEs in addressing data management challenges that require collaboration between different actors (including data providers, customers of the SME, the employees of the SME itself, external experts, scientists or consultants) and integrated data management solutions which combine different technologies and resources (such as datasets coming from different, not harmonised, data sources, computing resources, data analytics tools). SMEs will be selected on a first-come-first-served basis so be sure to apply today and take advantage of our services and resources. The first five applications which appropriately meet the requirements of the call and gain a score above the threshold will be selected for the open call. If five successful applications are received before 15 May 2017 (at 17:00 CEST), the call will be closed early. Proposals from consortia will not be accepted. Proposers can submit up to a maximum of three proposals. All three will be considered. With the support of the BlueBRIDGE consortium, successful SMEs will be able to set up (in a maximum 1 month) a tailored virtual collaborative environment (what we commonly call a VRE) that they can use to address their data management challenges. The virtual environment is a web-based application that each SME will build on the basis of its own needs in terms of datasets, services and technologies and data analytics (Click on the following links to see the datasets, the services and technologies, and the data analytics tools that BlueBRIDGE makes available to each SME and that you can use to build your virtual environment). To date, over 1,400 users from the fisheries and the aquaculture sectors are already exploiting the BlueBRIDGE virtual environments. Click here to see some examples of the virtual environments already delivered to different users and communities. No financial resources or funding are provided in this call. Winners will be able to exploit all the BlueBRIDGE resources and the Consortium skills and expertise for free until February 2018. After this date, if the SME is interested in continuing to use it, a new request must be submitted to BlueBRIDGE. There are a number of reasons why you might want to set up a virtual collaborative environment. It could be to solve a data management issue that requires collaboration among different actors, or to improve your existing services or technologies and offer a better service to your customers. It could even be to set up a new service and therefore enhance your portfolio. Download the proposal application template here and complete all five sections. Incomplete proposals will be rejected. REQUESTED BLUEBRIDGE DATASETS, SERVICES AND RESOURCES: Please select from the given list which BlueBRIDGE datasets, services and technologies, and data analytics will be required for your application. OPEN ACCESS: Indicate your willingness to share your data. Identify the type of data that you will be sharing and an overall percentage. The more data you share on the BlueBRIDGE infrastructure, the more access to resources we will provide. Open access is not mandatory but strongly encouraged. Submit your proposal through the online submission portal no later than the 15th May 2017 at 17:00 CET. Remember that the first five applications which appropriately meet the requirements of the call and gain a score above the threshold will be selected for the open call. If five successful applications are received before 15 May, the call will be closed early. Applications submitted after the 15th May 2017 at 17:00 CET will be rejected. As proposals are received via the online application form, the proposals are sent to the appointed evaluators. Evaluators have 15 days to perform the evaluation and communicate the result to the proposers. Each proposal will be evaluated by three experts selected among the BlueBRIDGE Consortium members. All the proposals collecting a score above the threshold of 70 will be selected. Criteria I. The proposer should provide a clear problem statement that can be addressed by BlueBRIDGE. The proposal should clearly state which services, datasets and resources from the BlueBRIDGE catalogue will be used (The BlueBRIDGE consortium reserves the right to suggest other services if deemed more appropriate). The proposal may require the implementation of new tools/integration of new datasets/etc. Proposals which foresee a minimum level of new implementation will be preferred. Proposals which indicate how information and feedback on the use of these tools and procedures will be provided will get a higher score. Criteria II. Evaluation will reflect the degree of innovation therefore, you should showcase how BlueBRIDGE may impact the growth/innovation/business/service portfolio/research etc of your organisation. Explain if the usage is pushing the boundaries of the domain. In order to demonstrate these criteria, the proposer may opt to indicate the State of the Art in the appropriate field. Criteria III. Indicate how you could continue to use the collaborative environment beyond the open call duration. Please indicate possible follow-up activities and business opportunities that you could see. Criteria IV. Open access data can benefit both business and science. If the data used is made open access then you will be at an advantage in your application. Provide information on all specifications requested by BlueBRIDGE. Submit a final report at the end of the VRE testing & roll out period. Attend and present their usage for the BlueBRIDGE services, results and impact on their business at the BlueBRIDGE Final event, January 2018. Travel expenses for one representative will be provided by the BlueBRIDGE project. The selected applicants may be asked to perform lightweight activities such as supporting content in a video interview, leaving a testimonial, describing their own challenges etc. Two dedicated persons will be assigned to each applicant. The BlueBRIDGE interface will be the main contact point for the applicant for all the administrative and management questions. The BlueBRIDGE enabler will be the person responsible for following the application design, implementation and roll out. Training: The BlueBRIDGE team, before starting the design and implementation of the VRE, will train the applicant on how to create a VRE, what are the facilities available in BlueBRIDGE and the benefits he/she can get from its usage. Applicants will be provided with documentation on the various tools and resources available. Webinars and f2f events will be also used. Deeper study of the problem of the applicants: The BlueBRIDGE team will invest effort to fully understand what the goals of the applicants are and will suggest (alternative) ways to reach their goals (Design phase). 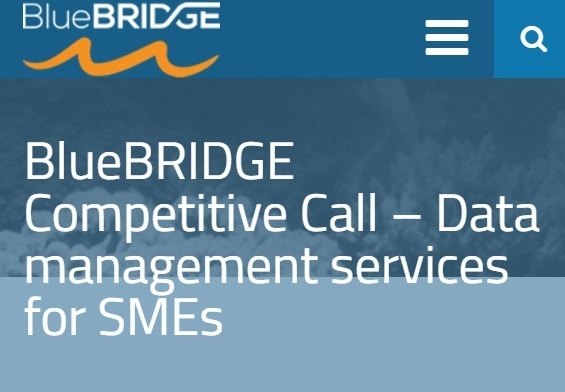 Technical consultancy & Monitoring: The BlueBRIDGE team will be in close contact with the applicant once the VRE is up and running (monthly calls). Additionally, a 24/7 operational support will be provided.